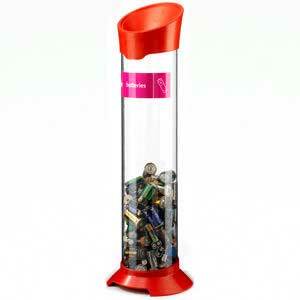 Product WBA-ST20-BAT: 20-litre capacity battery recycling bin, with dimensions of 830mm x 310mm. Battery Recycling Law for Shops: From February 2010, all shops that sell more than one pack of batteries a day have a legal obligation to provide a container for shoppers to recycle old batteries. 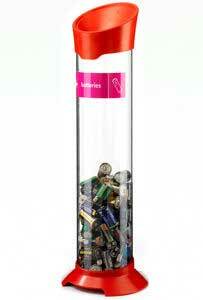 Recycling batteries protects the environment. Please be aware that these bins should be positioned where the contents cannot be easily accessed by young children. Clear recycling tubes for used batteries. 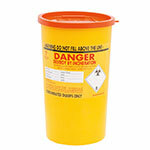 These battery recycling bins, part of the wide range of products to purchase from ESE Direct, are clear tubes for the storage and the recycling of used batteries. 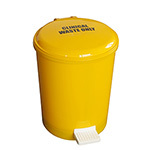 The bins are available in three different sizes: 5, 10 and 20 litres. 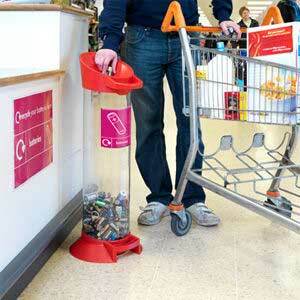 The larger of the bins, the 20-litre model, features convenient handles for carrying and emptying purposes. The battery recycling bins are a great option for shops, offices and other environments where batteries are in constant use. The minerals found in batteries, including zinc, lead, mercury and lithium, can be recovered in the recycling process and used again to make new batteries or some other product. The recycling of batteries is a positive step for the environment because otherwise the potentially hazardous minerals would go to landfill. Although mercury is being eliminated from alkaline batteries, the mercury in button batteries cannot be removed and they remain hazardous from that point of view. At a time when everyone is being asked to make their contribution to environmental protection, these battery recycling bins make a great addition to the workplace. Schools would also benefit from having them. Placed in the classroom, the bins would offer an easy and highly visible lesson to children on the importance of recycling batteries. WBA-ST05-BAT - Fab! Perfect that it is clear, it stops people from putting normal rubbish in. you also don't have to check when it needs emptying. would definitely recommend.